I was at the beach this summer and had some caramel candy "pinwheels." They were soft caramel with some type of white center and they were swirled like pinwheels. Do you know what these are called and how to make them? Mmmmm. Those Caramel candies sound really wonderful. I'm almost positive I know exactly what you are referring to, but I haven't had them in years. Something similar is the Bullseye Caramel and Cream Candy by Goetz that's always been one of my mother's favorite treats. I don't have a recipe for caramel pinwheel candies, but maybe someone else does. Anyone??? If not, I wonder if we could come up with one from scratch. Making the chewy caramel shouldn't be too hard. There are plenty of recipes for that. For the cream part, you could experiment with some of the fondant recipes until you find a cream center that you prefer. You can then make up your caramel and roll it out. Spread a fondant layer on top and then roll the whole thing up lengthwise and slice into pinwheels. If you give it a try and come up with a masterpiece, I hope you'll come back and share the results and recipe with us. I searched for this candy for many years before finding it at Pulakos 926 Chocolates in Erie, PA. It's not quite the same as the ones I used to get at Leed's Candies in Uniontown, PA when I was a kid, but they are still really good and the only thing I've found that is even close. You can order them online, but they're only available in the summer. I just sent a message to Pulakos on facebook last week and they said there first ones will be available the first week of May. I can't wait! I can't find a chewy caramel recepie that looks like it will work, does anyone know any good ones? Yes, it was in the 50's when I sat in my grandmother's Kentucky, turquoise and stainless steel kitchen--the height of home fashion--while she needed dinner's left-over mashed potatoes with 10x (powdered) sugar to make that wonderful creme center. Yes, un-peppered mashed potatoes! I never got that recipe from her and my none-too nice uncle has never seemed to get it to me. Anyway, if you have that old fashioned, stuff-of-dreams recipe, I'd love to have it! I've looked for years. The mass-produced candies are okay . . . but nothing like the smooth, creamy, texture of homemade vanilla caramel wrapped lovingly around silky smooth, sweet-creme, wrapped in waxed paper and twisted at the ends. Ahhhhhhhh! Memories! When we where just kids my dad called them "Snirkels" and we loved them. He used to always promise us a "empty box of caramel snirkels". We never caught the word empty, but when we would get them we appreciated them even more. We'd love the recipe you described for the caramel candy pinwheels that you made. 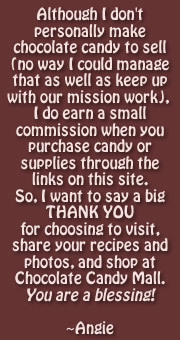 You didn't leave your email address, but if you don't mind sharing the caramel candy recipe with all of us, you can just add it here so others who are searching can easily find it, too. I have actually made this candy. I made them last week and they are the BOMB. I made my own carmel, and for the center I used some cream cheese and a few other ingredients. If you would like the recipe you can email me and I will be happy to share it with you.